No period ever seems as strange and unfamiliar as one which is well within living memory. Virginia Nicholson likens her journey into the decade of her birth to ‘alighting on another planet’ and says that ‘researching the 1950s has often felt like time travel.’ Her portrait of subservient wives and sexually ignorant (or innocent) females is certainly one that comes from a different world. In material terms the period should be divided into two sections. The early years were a continuation, in some cases an intensification, of wartime and postwar austerity. Rationing of some basic food did not end until 1954. In the second half of the decade prosperity crept in and it became possible to splash out on food, clothes, holidays and gadgets. In 1953, so few people owned television sets that anyone who did was besieged by friends and neighbours on coronation day. 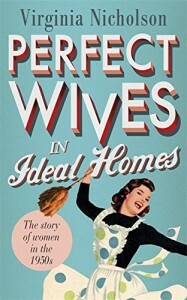 This book gives many instances of women who did just that, particularly those who deferred in every way to their husbands, or indeed, just to men. Several examples describe women who gave up all their own hobbies, interests and friends on getting married; with the husband at once father, lover, boss and jailer, perhaps one should not be surprised or disgusted by the man who punished his wife for swearing by confiscating her pearls for seven years. Part of this perpetual childishness of the unequal wife was, in sadly many cases, a total ignorance of human biology. Young women were taken by surprise by their periods, didn’t know what would happen on their wedding night, and, tragically, some passed their whole lives without realizing that what happened in bed could give women any pleasure. There are stories of unmarried mothers and their helplessness when their babies were taken away for adoption; of a Jamaican nurse offered a grass skirt to wear at a student entertainment; of clever young graduates denied promotion and paid a fraction of what male contemporaries earned. An unavoidable essential to understanding the period is men’s attitude to women, and even more important, women’s attitude to themselves, best expressed by the big circulation women’s magazines. 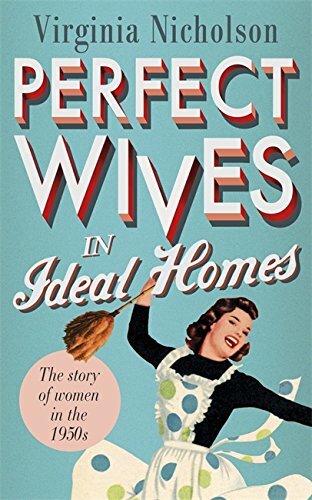 ‘Don’t try to be the boss.’ It was against nature for women to perform tasks that should be a husband’s job, or for him to help with hers, whether it was the arduous whitening of the Northern housewife’s front door step or simply looking after the children. Nicholson who was five when the decade ended, has written a fascinating and fluent account of what she believes was an enchanted period, ‘washed with gaiety, innocence and grainy colours.’ I was thirteen in 1950, and remember those years very differently. Looking back from the far side of the chasm between the postwar era and the post liberation era, I am reminded that my teenage years have already become the past that is a foreign country.